On September 18, the Church celebrates the life of St. Joseph of Cupertino, a mystic who was perhaps most famous for his ability to fly. 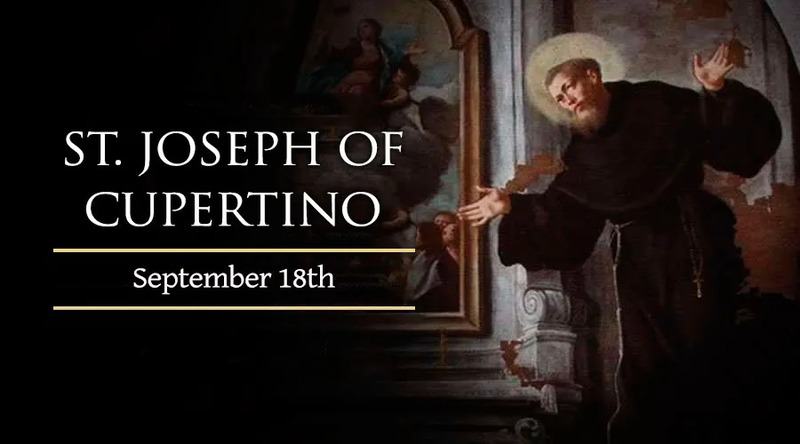 His father, a poor carpenter, died before his birth and his mother, who was unable to pay the debts, lost her home and gave birth to Joseph in a stable at Cupertino, Italy on June 17, 1603. Joseph began having mystical visions when he was seven, and was often so lost to the world around him that the other children made fun of him giving him the nickname, "open-mouthed" for his gaping manner. He had an irascible temper and read very poorly, giving others the impression that he was dumb and good for nothing. Aside from that, he was so continually drawn into ecstasy that it was impossible for him to be attentive to the tasks at hand. Thus, when he secured a job, he lost it very quickly. He finally managed to obtain a post taking care of a stable in a Franciscan convent near Cupertino. Upon realizing his holiness and aptitude for penance, humility, and obedience, it was decided that he could begin studying for the priesthood. It was also soon recognized that though he knew little by way of worldly knowledge and had little capacity to learn, Joseph was infused with a divine knowledge that made him capable of solving some of the most intricate theological quandaries. For the last 35 years of his life as a priest he was unable to celebrate Mass in public because he would often, without being able to help it, be lifted up into the air when he went into an ecstatic state, which happened at nearly every Mass. It took only the slightest reference of anything having to do with God in order for this state to be induced in him. Despite being moved from one friary to another, because of the disruption he caused by his ecstasies and the persecutions he endured from some of his brothers who were envious of his gifts, he remained profoundly inundated by the joy of abandoning himself to Divine Providence. He died on September 18, 1663 and was canonized in 1767 by Pope Clement XIII. He is the patron of air travelers and students preparing for exams.